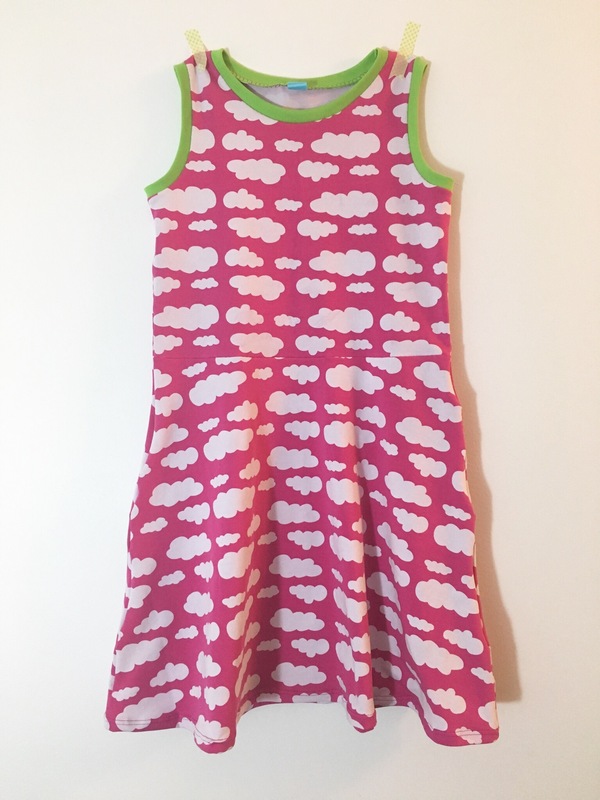 Sometimes it’s fun to make something quick, easy, and adorable and the Little Girl Skater Dress by Kitschy Coo checks all those boxes. This is the size 7/8 in a watermelon colour theme. This is the second time I’ve used this pattern. 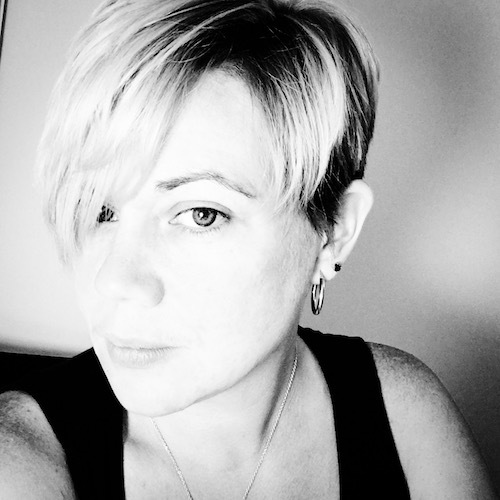 Last time I did this in a winter dress with long sleeves and using french terry. 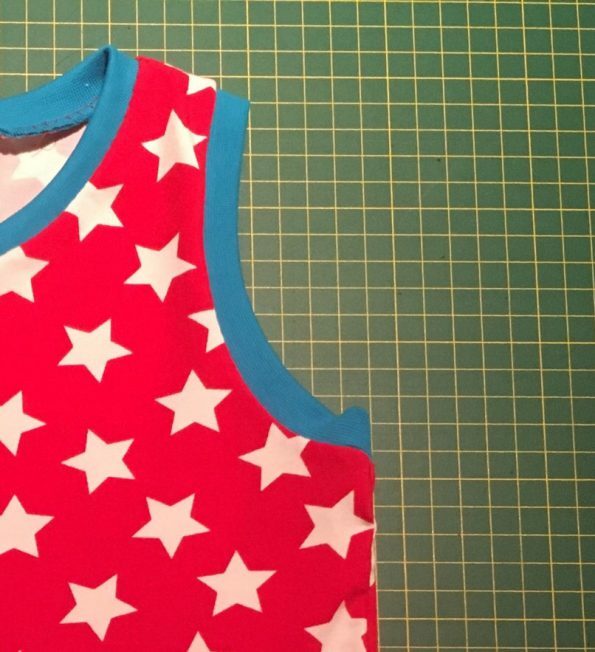 This time I used cotton jersey and made the sleeveless version. This is the size 5/6 in red and turquoise. 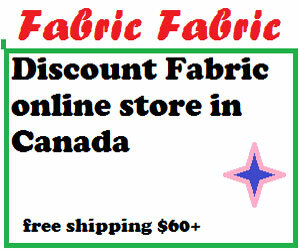 The fabric is from l’Oiseau Fabrics. I used their jersey for the dresses and ribbing for trim. 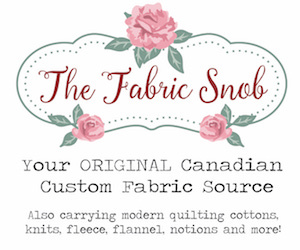 All are really high quality and perfectly suited for the pattern. This is the size 3/4 in turquoise and purple. 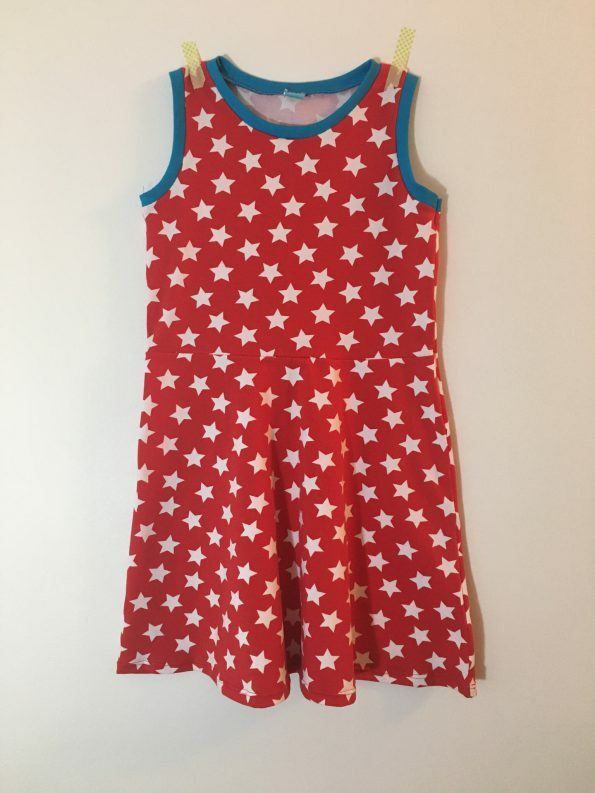 The pattern combines two sizes in one, and this works great for my kids, since they can wear the dress for a long time. I didn’t make any alterations at all. 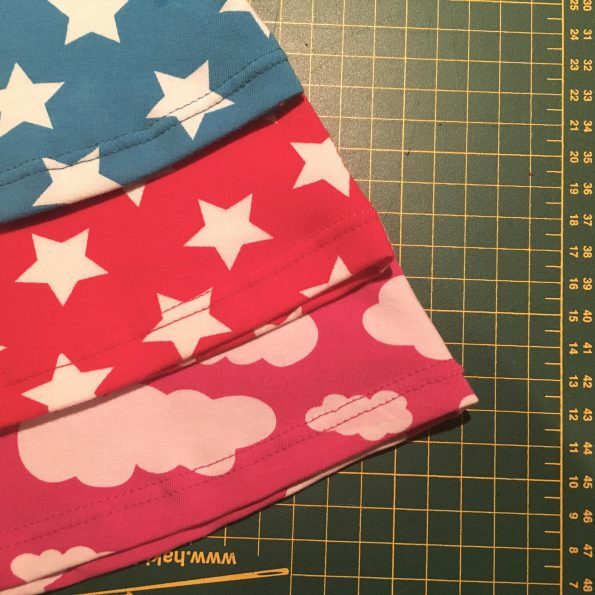 Various cotton spandex jersey prints in a sky theme. This project is part of the Kids Clothes Week sew along, the Monthly Stitch August challenge: Triple Trouble, and the Stashbusting Sewalong. 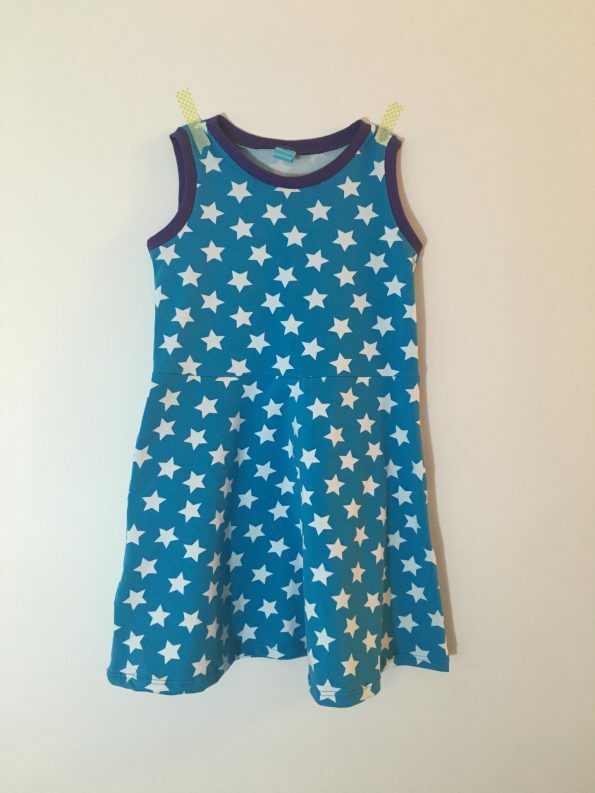 Pattern: Little Girl’s Skater Dress by Kitschy Coo available in sizes 18m-8y. I chose the sleeveless view. There are also short sleeve and long sleeve versions. Fabric: Starlight Jersey Knit in red and turquoise. 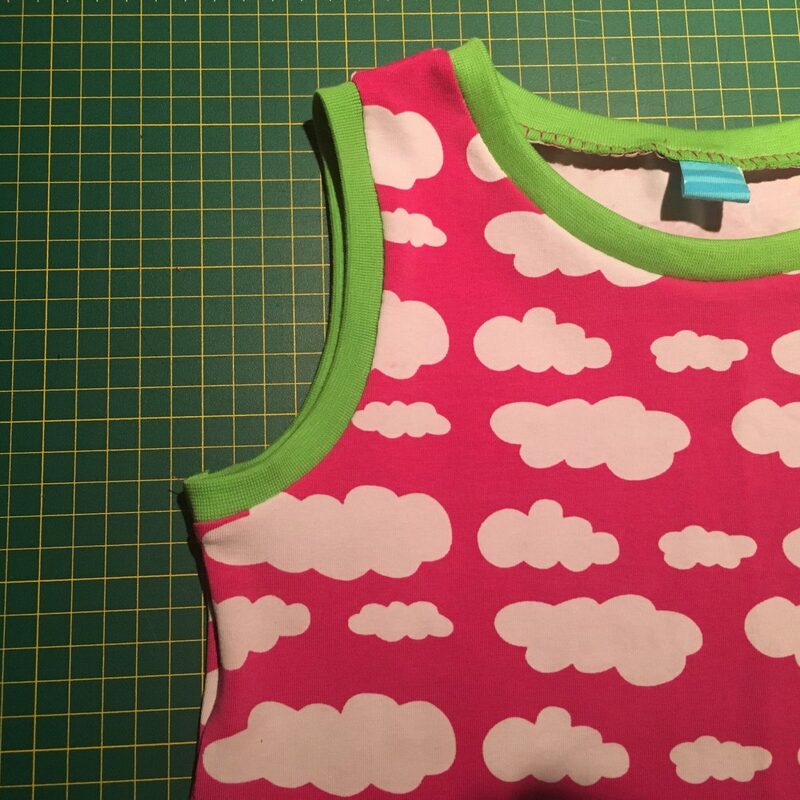 Cloudy jersey knit in pink. Stretch ribbing in Aqua, purple and lime. All 95% cotton, 5% spandex. All from l’Oiseau Fabrics. Cost: Pattern: £7.20 Fabric: About $24/dress. Results: Great. Makes a cute, comfortable dress the kids love.